Rheumatoid arthritis (RA for short) is a debilitating autoimmune disease that attacks the synovial tissues around the body’s joints. This affliction causes chronic swelling, severe pain, and in some instances, permanent disabilities. RA “tricks” the body’s immune system into creating its own tissues to help fight back bacteria and viruses when none exist. As a result, the immune system inadvertently damages the synovial tissue found in and around the body’s joints. The damaged synovial tissue leads to the severely debilitating symptoms of Rheumatoid Arthritis. Recent studies have found that 41 out of every 100,000 people are diagnosed with rheumatoid arthritis every year. All age groups, sexes, and demographics are at risk of contracting RA; however, females are two-and-a-half times more likely to get it than males. Females also tend to contract it sooner in life (between ages 30 and 60). 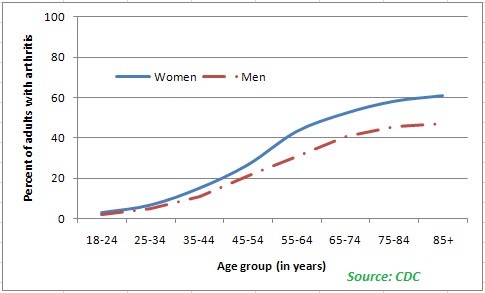 However, there is no specific cutoff age for contracting rheumatoid arthritis. According to the Arthritis Foundation, over 300,000 American children have been diagnosed with some form of Juvenile Rheumatoid Arthritis. People diagnosed with rheumatoid arthritis have a 60% greater risk of having a heart attack than those who do not have it. The risk of stroke is also significantly increased. Rheumatoid arthritis sufferers are also twice as likely to suffer from depression. The statistics above show just how damaging rheumatoid arthritis can be – not only to the individual, but society as a whole. That’s why it’s imperative that we have a better understanding of how RA affects us, and how we can effectively treat and live with the disease. Below you’ll find her experience of how she’s dealt with the disease, and how she continues to courageously work towards living as close to a normal life as possible. Pam: When did you start to believe there might be something wrong with your joints (or, when did you know it was time to see a doctor)? Lesli: It was 1987. I’d been living in Northern Germany with my Air Force husband and my 6-year-old daughter for about five months, and had just gotten a job working as an illustrator for the base. He and I decided to take a romantic mini-vacation in Luebeck, a historical city near the Baltic Sea, and close to the border with East Germany. We hadn’t been able to do any real traveling before that, so we were excited about it. Our first day there, as we were wandering the city center, we happened on a shoe store, and I found a beautiful pair of low-heeled pumps. They fit me perfectly and felt great, so I decided to wear them out of the store. We continued our wander, enjoying ourselves and marveling over our many-centuries-old surroundings. A few hours later, my right foot suddenly began to hurt at the base of my toes. Naturally, I put it down to a problem with my new shoes and reluctantly changed back into my old pair. But the pain didn’t stop. Instead, it got worse … and worse … until it was so bad I could barely put my weight on it. Worse, it hurt horribly even when I sat down. The pain radiated through my entire foot and almost up to my knee, and was so intense that it brought me to tears. My husband bought me some aspirin, but it had no effect. That awful foot pain lasted throughout the night and well into the following day, effectively ruining our romantic weekend. We went home. And oddly, by the next morning, my foot was fine. It felt completely normal. I put the offending new shoes in the back of my closet, swearing I’d never wear them again. A few weeks later my work sent me to a conference in the southern German city of Frankfurt. I took a train, since I was unused to driving the Autobahn and didn’t want to do it alone. Once again, a few hours into the trip my foot started hurting, but this time it was my left foot. I was completely baffled. I was wearing my everyday travel shoes—they’d never hurt me before, and I’d had them for years. By the time I got to Frankfurt, walking was miserable—and I was carrying a suitcase, too. I got to my hotel and limped up the stairs to my room. As I was eating my supper in the hotel restaurant, my right hand began to ache, too. Baffled, I took some aspirin before bed and hoped all this mysterious pain would go away before morning. It didn’t. I attended the day-long conference with my foot aching maliciously and my hand hurting so badly I could barely hold a pencil, let alone write. I don’t remember the trip home at all, but obviously I managed it somehow. Since I hadn’t worn the suspect new shoes, the pain was in the other foot, and it was in my right hand, too, there was no way I could explain the pain away. And as I thought about it, I remembered other times over the previous six months when I’d had milder, but equally inexplicable pain in other joints, too. A shoulder, for instance, or a wrist, or an elbow. Each time, I’d simply thought I’d somehow “slept wrong,” since there was no other logical explanation, and when it went away a few hours later, I forgot about it. This time, I made an appointment to see a doctor at the Army hospital on the base. Pam: When were you diagnosed with rheumatoid arthritis? How did you react to your new diagnosis? Leslie: I hadn’t been to the doctor there before, so I was assigned to an internal medicine specialist. Dr. C listened to my story about my feet, my hand, and the other joints, and wrote me up a slip to take the lab. He didn’t speculate about what might be causing the problem, but told me to come back in a week and we’d go over the results. And, he told me to come back in right away if I experienced that pain again. When I went back a week later, I learned that the RH factor in my blood was sky-high—more than enough for Dr. C to diagnose rheumatoid arthritis, given the symptoms I’d described as happening off and on for the last six months. He explained, briefly, was RA was and told me that while it was incurable, it could be treated with medications. I was surprised, to say the least. Never in my wildest dreams had I expected such a diagnosis! The only arthritis I’d ever heard of was the kind that old people got, and I only knew of it from television commercials selling Deep Heating Rub. I was only 31! How could I have an old people’s disease? He explained that this was a different type of arthritis, caused by an overactive immune system, and that indeed, sometimes people as young as me got it. He said they didn’t know what caused it. He told me to take three tablets of aspirin three times a day, and set up another appointment for a month later. I should come back to see him if I had another “flare.” It was the first time I’d heard that term. Pam: How did you further your education about rheumatoid arthritis and the different treatment options available? Leslie: I went to the base library—I’ve always been a library person and they had a pretty good one there—to see if I could find any books about it. There were none, but I looked it up in an encyclopedia. I learned a little more, but not much. The librarian found the address of the American Arthritis Foundation for me, and I wrote to them. A couple of months later (mail took at least two weeks to get to the States from Europe through the military mail system) I received a pamphlet from them. It was mostly about osteoarthritis. The part about RA was short and told me no more than I already knew. They did mention NSAIDs as treatment options, along with a nutritious diet and gentle exercise. There were no other medications covered, but that was probably because at the time, there weren’t many to speak of. I couldn’t find any more information about RA after that. To be honest, I really had no idea what to look for, how to look for it, or even what questions to ask. I took my aspirin, hoped it would help, and didn’t really believe, frankly, that I was going to face this disease and the pain and disability it could cause for the rest of my life. I was too young—and too naïve—to really think hard about it. Pam: Which medicines (if any) were you prescribed to help with your rheumatoid arthritis? How effective have they been? Leslie: As I mentioned, I started with aspirin as my sole treatment. When it didn’t work, bothered my stomach and made my ears start ringing, Dr. C started me on Naproxen instead. That also didn’t work, and it made me very nauseous. He switched me to another (I can’t recall now which one), still to no avail. By then I was experiencing truly awful flares at least twice a week; they’d last from eight hours to three or four days each. To relieve the pain, Dr. C prescribed Tylenol 3 (Tylenol with codeine) 10 tablets at a time. I had to come in and see him to get them. If it was a weekend, I had to go to the ER, and they’d call him to get authorization to give them to me. Eventually, T3 wasn’t enough to relieve the pain, and he alternated it with Percocet or Vicodin. Still, never more than 10 tabs at a time. Eventually—and this was over a 5-year period—Dr. C prescribed plaquenil, then oral gold. Neither of them had any effect on my RA. I was in serious, near constant pain. A caveat, here. Like most people in this day and age, I expected the drugs my doctors gave me to fix what was ailing me. I didn’t understand, then, that NSAIDs and DMARDs wouldn’t necessarily relieve the symptoms of the disease, and I didn’t understand what the disease was doing to my body. So when these drugs didn’t work within a few months, I became lackadaisical about taking them. Nearly all of them bothered my stomach, and I came to feel that I didn’t want to feel sick all the time along with having all that RA pain. By the time I came back to the States in 1992, I’d stopped taking any RA drugs (except for painkillers, when I could get them) because none of them “worked.” I didn’t understand that even if they didn’t relieve my symptoms, they might slow the progression of the disease. In fact, I didn’t even understand that RA was progressive. Pam: What other treatments have you previously utilized to treat your rheumatoid arthritis? How well did they work? Leslie: Over the years I’ve tried it all. Copper bracelets, magnets, glucosamine and chondroitin, cutting nightshade vegetables out of my diet, etc. None of it had the least effect on my RA. I also tried to eat a healthy diet (at least, what I thought was a healthy diet) in those early years, too. I was always watching my weight. At the time, the standard “healthy” diet for weight loss or maintenance required sticking to low-fat, high carbohydrate foods, protein, and vegetables and fruits. I didn’t like beef very much, so mostly I ate chicken and fish. But that diet (including the occasional splurge) didn’t work very well for my weight—and it also had no effect on my RA. Since then, I’ve continued to battle my weight, so I’ve always been mindful about what I eat. These days, I stick to a low-carb, high protein diet that’s low in extra fats. Those I do eat are in the form of olive or canola oil, and very occasionally, a little butter. Sweets are off-limits except for rare treats, most of the time. Like most people, I fail to keep to my diet 365 days a year, so my weight has yo-yo’d over the years. But I keep trying, and in general, my diet is healthy and nutritious. I still eat very little beef. In those early years, I didn’t have a specific exercise regime, but we had a wire-haired dachshund that we needed to walk several times a day. We lived in a third-floor, walk-up flat off-base, in the city. That meant I walked quite a distance every day, including the climb up those three long flights of stairs every time we got home. And, instead of driving, as a family we walked and used the city bus, and the train, for shopping and sightseeing. I held my illustrating job for 18 months, then took a new job at the base’s Public Affairs Office as a writer/editor. That job meant even more walking. So I figured I was getting plenty of “gentle” exercise. Since then, over the years my exercise habits have fluctuated, but walking continues to be the type of exercise I do most often because of my RA. Leslie: I’m usually stiff and sore in the morning, like most people, whether I’m having a “flare” or not. It takes 1-2 hours before I’m moving more easily. But for me, the evenings are generally the worst. My hands, ankles and feet hurt a lot. For me, it’s usually not activities that cause more pain and flares, it’s a changing barometer. Any barometric movement up or down will cause more tenderness in my hands and feet; a larger, sustained rise in the barometer make me hurt more and can trigger a more serious flare. Pam: How big of a role have your relationships played in giving you added support for your disease (i.e. family, friends, coworkers, colleagues, etc.)? Leslie: My family and friends are supportive when I tell them I’m in pain and need assistance. Same for coworkers and colleagues. That support weakens, however, if I’m unable to carry out assigned tasks or obligations. It’s hard for others when they’re disappointed or left holding the bag because I can’t do my part because of my RA. Can’t blame them, but that’s often when I need their support the most. Pam: What has been your greatest achievement (or, victory) since your diagnosis? Leslie: Two stand out: skiing in the Austrian Alps, and backpacking in the Desolation Wilderness in Northern California. Pam: What has been your greatest disappointment since your diagnosis? Pam: What was your outlook on life before your diagnosis? What is your current outlook on life after your diagnosis? Leslie: I’ve always been an optimist, and I’ve always tried to take life one day at a time. That didn’t change with my diagnosis, nor has it changed since. I don’t believe in dwelling on the past or attempting to live in the future. Life is precious, and there are gifts everywhere, if we just look for them. Pam: What advice would you give others who are currently affected by rheumatoid arthritis? Leslie: To be patient and gentle with themselves, and to accept it as best they can. RA isn’t a death sentence. Today’s drugs can control and drastically slow the progression of the disease, so disability and deformity are far less common than they once were. I’d also tell them not to be taken in by miracle “cures” and treatments. They don’t work, and they’ll only be a disappointment. (I’ve tried them—I know). See a rheumatologist for your RA and be compliant and patient with the medications. Finally, I’d tell them to take good care of and believe in themselves. Eat fresh, healthy foods, keep your weight under control (extra weight stresses joints, which means more pain), and move your body every day to keep joints and muscles strong and supple. It all helps make living with RA easier. Pam: Summarize the three main areas of your life that have been negatively impacted because of your rheumatoid arthritis. Leslie: a) RA has kept me from pursuing more physical and strenuous careers. I’d have loved to be a paramedic, but it’s simply not practical with my RA as it is. b) Pain and tenderness in my hands and sometimes, other joints often keep me from doing some of the things I want to do. I love to cook, but sometimes I just can’t because my hands are too painful for chopping, etc. c) I’m an artist. There are times when my hands are too sore and tender to grip a brush or pencil securely. That’s always frustrating, but fortunately, it’s not an everyday problem. Pam: How has your diagnosis affected you emotionally? Leslie: When I was first diagnosed, and when my RA was at its most painful and disabling, I cried a lot, mainly in frustration. I was also angry, but I found that there was no real target for my anger. My RA wasn’t the result of something I’d done wrong, and as an agnostic, I didn’t (and still don’t) believe it was a punishment from some higher power. RA just is. I learned early on to accept it and get on with my life as best I could. That is not to say that I never have emotional moments because of it. The frustration is still there, though I rarely cry or get angry over it anymore. I just acknowledge my upset and move on. Pam: Have you actively sought out others who have been diagnosed with rheumatoid arthritis (support groups, forums, etc.)? If so, how has it affected you (positively or negatively)? Leslie: In 2005, my RA became active again after a six-year remission. Since I’d never met anyone else with RA in all the time I’d had it, and the Internet was proving to be such a great tool for reaching out to others, I started my blog, RheumaBlog. I hoped to be able to find and talk to others through it—and it worked. RheumaBlog and the Internet have been a hugely positive experience. I know lots of people who share this disease with me, now. I’ve even been fortunate enough to meet some of them face-to-face, which was amazing. Pam: How are you currently dealing with your rheumatoid arthritis on a daily basis? Leslie: Just like that, on a daily basis. Some days I can do a lot, some days, I can’t. Pain kept me awake most of last night, so I went back to bed and slept a couple more hours this morning. Felt better afterwards. Pain still here, but bearable with rest. Each day is like that. In general, I try to eat a healthy diet, watch my weight, and make an effort to get out and walk each day. I’m not perfect, and not always successful, but being mindful helps me keep on track. Finally, I go out of my way to look for the gifts each day brings. It can be as simple as a hummingbird at the feeder on the patio, or the new gardenia blossoms and their delicious scent. Mindfulness is key and keeps me centered and grateful to be alive. Do you have something to ask Leslie Vandever? Please leave your comment below. Thank You for your encouraging blog about RA. I have just been diagnosed with RA. I won`t lie. It`s horrible. Adjustment is necessary. I hope and wish you as many pain free moments as you can muster. Thanks for your visit to Healthy News 24. I hope you like it and motivated by it anyway.